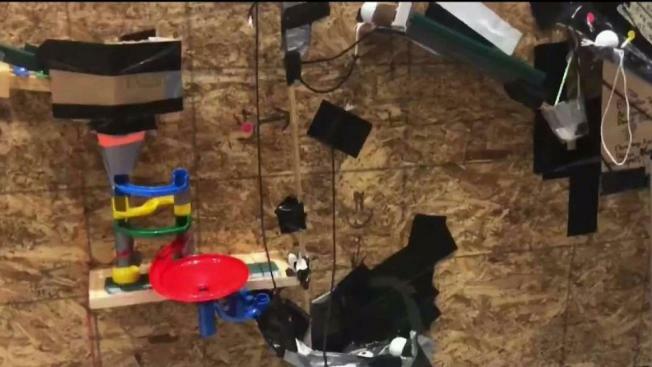 Junior high students at Valley Christian in San Jose spent the past month building what is believed to be one of the most elaborate Rube Goldberg machines on record. Junior high students at Valley Christian in San Jose spent the past month building an elaborate Rube Goldberg machine. Those students set off the intricate, chain reaction contraption Wednesday morning in hopes of breaking a Guinness World Record. Unfortunately, they came up short. A Rube Goldberg machine features a number of smaller devices or pieces of equipment connected together in a continuous, complicated manner. When the first device is triggered, it sets off a chain reaction utilizing the other devices in line. The South Bay students' machine featured 450 steps, according to the school. Their contraption worked, but it didn't qualify for the world record because teachers at times had to jump in and intervene when the chain reaction process came to a halt. "A world record would have been a wonderful thing, however, the process that took them through the learning of this — a STEM measurement — it couldn't be better when compared to a world record," VCJH Principal Brian Clemons said. "The students learning through this, it's a once-in-a-lifetime thing." The current record for the largest Rube Goldberg machine is 412 steps, according to the school.